A chemical released by a bacterium sends this protozoan, Salpinogoeca rosetta, into a mating swarm. Credit: Arielle Woznica, University of California, Berkeley. Among the myriad phenomena discussed at ASCB 2016, cell signaling and bacterial enzymes that set off eukaryote mating swarms were among the most intriguing. At the Logic of Signaling Symposium, two researchers—the Broad Institute’s Aviv Regev and Denise Montell from the University of California, Santa Barbara—discussed their work determining how cells respond to a variety of biological signals. 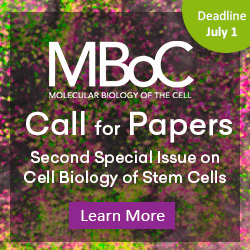 Regev’s lab has focused on developing new methods for single-cell RNA profiling to determine how cells of the same type can respond very differently to the same molecular binding or hormonal signals. Regev began her career as a computational biologist but has expanded her work into biological experimentation. She explained how she explores tumors as ecosystems, determining what distinguishes cell types within the cancer and how individual cells within those types differ from one another. In recent work with melanoma, Regev’s lab studied 4,645 individual cells from the tumors of 19 different patients to work through basic questions about how different cells interact with each other within a tumor and how individual cells of each type can affect response to therapy. Previous studies have used bulk sequencing of cells of different types to study genetic expression. But by distinguishing among individual cells, she noted, single-cell experiments may discern the specific tumor cells that control drug responses and, possibly, recurrence and metastases. An added benefit: Responses from rare cell types are less likely to be lost in the cacophony of responses from surrounding cells. Montell’s work in signaling also looks at tumor metastasis and cellular behavior, but it centers more on apoptosis and an unexpected cell state that she and colleagues have dubbed anastasis (Greek for “resurrection,” or “standing up again”). It had been thought that cells subjected to a toxin went past a point of no return—duriapoptosis—in which the cells shrank, nuclei condensed, and membranes blistered. But a postdoctoral fellow in Montell’s lab discovered that if the toxin is washed away, the vast majority of the cells could recover, repair their damaged DNA, survive, and proliferate, albeit while retaining some mutations. The researchers are continuing to explore whether anastasis could be a key process in cancer relapse after aggressive treatments come to an end. They’re also looking at how anastasis may be implicated in degenerative disease and heart disease and may be of value to regenerative medicine. At Tuesday’s Minisymposium on Dark Matters in Signaling and Differentiation, evolutionary biologists discussed their work with choanoflagellates, eukaryotes that can live either individually as single-celled life forms or in multicellular colonies. Researchers suspect that these cells may lead them to understand how “fixed” multicellular colonies evolved to become the complex creatures seen today. 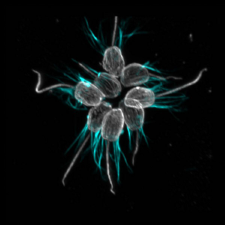 Researchers Nicole King and Arielle Woznica of the University of California, Berkeley, working with collaborators Jon Clardy and J.P. Gerdt at Harvard Medical School, exposed the choanoflagellate Salpinogoeca rosetta to the bacterium Vibrio fischeri. When V. fischeri released the enzyme chonodroitin sulfate lyase, the choanoflagellates within minutes began gathering into mating swarms, fusing, copying and recombining genetic data. The reaction marked the first time that bacteria have been shown to influence mating in eukaryotes and has triggered speculation that environmental bacteria may affect mating behavior in animals as well. The researchers previously discovered an interaction between S. rosetta and a different bacterium, Algoriphagus machipongonensis, that secretes three unique signals, including one that inhibits S. rosetta’s ability to form the rosette-shaped colonies for which it is named. Such observations come on the heels of recent discoveries about how bacteria that form the microbiome in the human gut can affect metabolism, immune responses, and disease progression.